… while searching their shelves of succulents I was amazed that so many of their tinier specimens were in bloom … and dissimilar varieties seemed to have the exact same blooms; same sizes, same colors, same everything. A close inspection betrayed the secret to their uniformity: SOMEONE HAD HOT-GLUED FLOWERS TO THEM! Again, this isn’t a big deal as deals go, yet there appears to be a network of propagators out there growing succulents and cacti expressly so they can be mistreated … Are people buying these things? Is there a demand for living plants that appear to be plastic? Does this mean that the era of pasting googly-eyes to cactus is finally over? As anyone who spends any time online already knows, the good ol’ U.S. of A. may be lacking in some respects but tastelessness is not one of them. 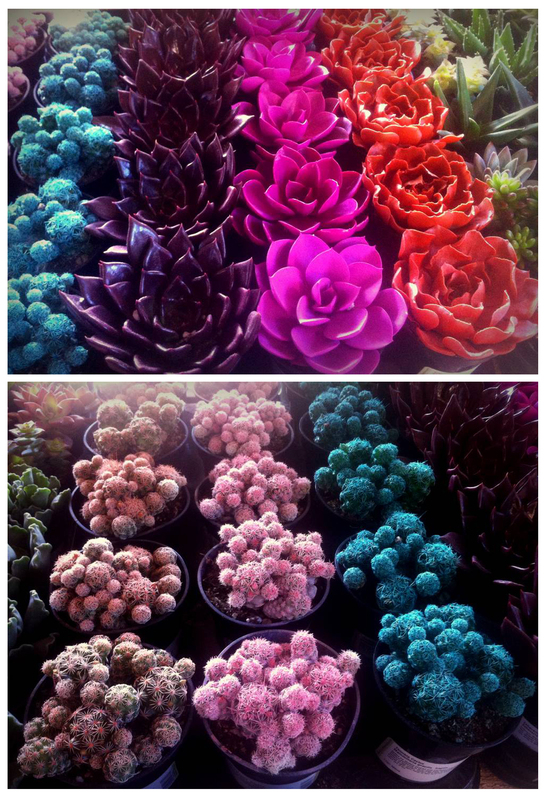 Which leads me back to those horrid KOSMIK KAKTUS … Who would be so tacky and taste-impaired as to market spray-painted succulents under a brand name with so many Ks? I’m pointing at you, KARDASHIANS! You may recognize this arrangement from a recent post (click here). When I planted this little cactus in this vessel I had no idea it would bloom so colorfully and spectacularly; I’m in love with its bright orange trumpets! from → Blogs, Cacti, California, Collections, Design, Display, Flowers, Gardening, Landscaping, Nursery, Opinion, Outdoor, Photography, Plants, Rancho Reubidoux, Riverside, California, Seen, Shopping, Succulents, Succulents in the News! That is pathetic as hell, but it does make a nice quirky photo ! I almost wished our local Home Depot had ’em so I could’ve taken my own photo! 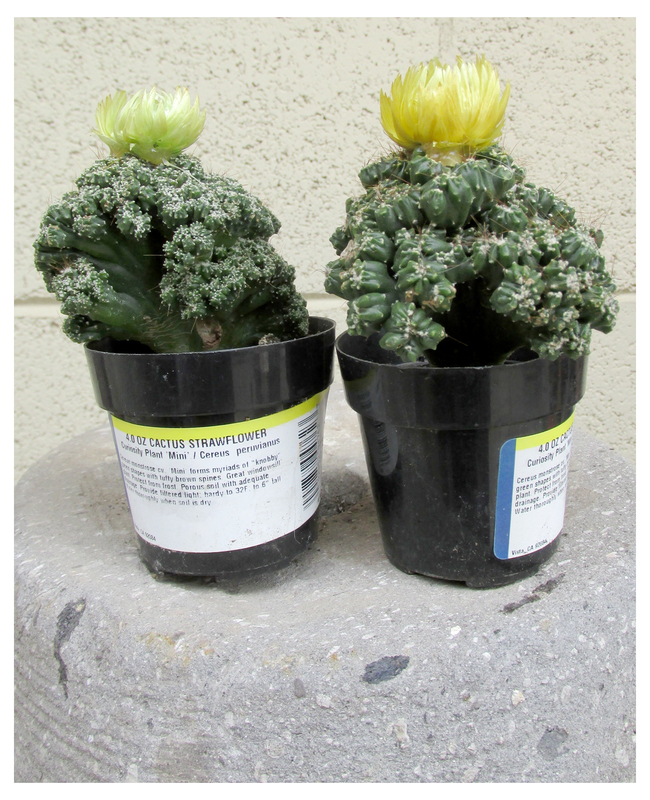 I saw those straw flowers glued to various cacti and succulents at Lowe’s yesterday. I wanted to cry FOUL! But I was in a hurry….. I spoke to the Lowe’s garden dept. cashier about the hot glued plants but she was too busy not caring less to address it: sigh. your palate cleanser is stunning! and i have to admit that i did breathe a sigh of relief that you were showing me spray painted cactus and not GMO cactus!!! Ugh! Don’t get me started on the whole GMO craziness … Thanks, re: the palate cleanser, I think it’s gorgeous, too! Here in Belgium they sell spray panted succulents and cacti with glued on flowers to, I feel so sorry for the plants !! It is pure madness !!! Can’t we start a petition or something to let the “makers” know they are abusing plants ! Well, I take a little comfort in knowing this insanity is not distinctly American … just a little. Thanks for commenting, Gwen, but I’m afraid that if it’s happening in Europe, too, this problem’s bigger than any petition can fix! Really?! I wouldn’t be surprised if someone doesn’t add an American twist, next, by dressing them in chaps and cowboy hats or something! Those dyed things were in stock a month or so ago. I bought one that didn’t have much dye on it because I wanted to replace my thimble cactus that the curvebill thrasher thrashed. Turns out if you leave it in the sun, the color goes away. How weird, about the sun changing the color … I’m still surprised they haven’t shown up here, in the Inland Empire! We’ll probably get everyone else’s unwanted KaKtus!! I posted on these too! crazy! This is so disgusting! If the paint disappears in the sun does it leave a residual film? Even the strangest of plants have beauty. All in the eye of the beholder, as they say. I agree, totally … in fact the stranger ones are the most beautiful to me! hahaha… Of course that would get your goad!!! God love you,… someone’s got to care about the poor little succulents. Your little specimen certainly seems happy! I have one here in mexico that I bought from a local vendor. (yeah, from the trunk of his car) It looks very similar but has little purple flowers on it. I separated it and added it to my variegated agave display. It makes me happy! … and it stuck in my craw, too! Grrrr … I love tacky but sometimes people go TOO FAR! Oh my gosh… I’m just now catching up on my email! 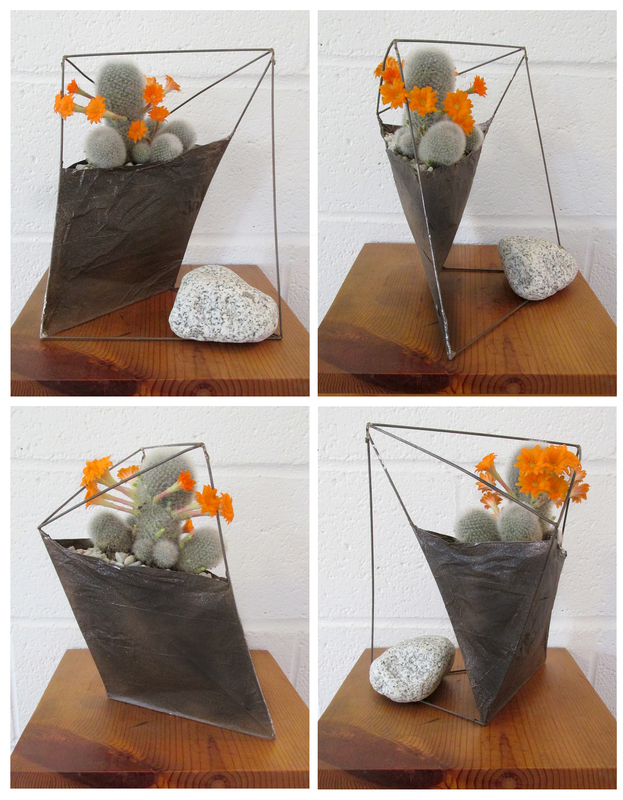 How horrible… I can’t believe someone is hot gluing flowers onto to cacti. I don’t even know what to say… I’m at a loss for words. On a happier note, I love your little blooms too… they’re so cute! The problem for me, Zach, is that the cactus doesn’t need spray paint to be beautiful and the paint is probably harming it in some way. I love oddly colored “fun” cactus, too, but in ceramic, plastic or some other material or even an image like a painting or doctored photo; I don’t see the need to injure or alter one that is perfectly fine naturally. For me it’s a matter of taste and sensibility; it just rubs me the wrong way. Here in Costa Rica there were some men selling orchids with huge flowers and buds. Turns out they had glued lillies to the orchid plants and were selling for $20.00 each. The police caught them and arrested then. Some people are so dishonest. I think it’s pretty spectacular, myself! I’m really shocked by ALL the hate on these plants. I saw these at Lowe’s and thought it was cool, different and gorgeous. I don’t get why everyone’s hating on them; it’s just a dyed cactus. Isn’t it practically the same as when people dye carnations? According to the container, its been dyed with non-toxic artificial treatment. Well, I’m not exactly a fan of dyed carnations, either, Sheri. My offense comes from someone having the bright idea to make natural items, like plants, more beautiful by changing their color, gluing things onto them, pasting googly eyes on them. All plants are lovely just as they are. If they appeal to you I can’t change that, but I find them horrible and their existence wrongminded.